THE Wamp Nga Mt Hagen Eagles beat the Fortuna Fresh Central Dabaris 26-24 in their Round 2 Digicel Cup match at the National Football Stadium. The entertaining affair in front of an estimated 6,000 fans was not without controversy with a penalty goal by Eagles halfback Israel Balio that looked to have missed its mark allowed by referee Michael Kalpe. Kalpe also awarded a penalty try to the Eagles for a dangerous challenge by Dabaris defender that saw the Western Highlanders take a 26-18 lead with four minutes remaining. Dabaris scored a consolation try through halfback Allan Simbiri which he converted. The home side maintained their positive style looking to attack from all parts of the field while the Eagles took a more conservative and physical approach. The Eagles, who beat defending champions Goroka Lahanis 8-6 in the opening round were forced to play a more expansive game which made for a more entertaining clash. In the earlier match of the double header, the PRK Gulf Isou stayed undefeated with a gutsy 12-10 win over the Lahanis. In Kimbe, the Lae Snax Tigers hammered hosts Kimbe Cutters 36-2 with Stanley Tepend’s side dominating the fixture with their experience and defence. 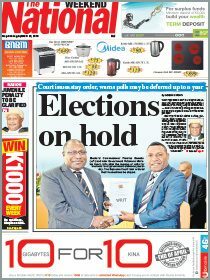 In Mendi, the PRK Mendi Muruks won a dour affair 2-0 over the Enga Mioks in wet conditions at the Joe Keviame Oval. 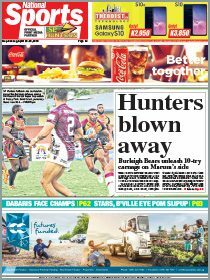 In Minj, Jiwaka, The Waghi Tumbe scored a come-from-behind 20-17 win over the NCDC Port Moresby Vipers. The Agmark Gurias thrashed the Kroton Hela Wigmen 32-8 at Kalabond Oval in Kokopo.